Should I Quit my Job to Become a Pro Blogger? This is a guest post by Adarsh Thampy, who is a full time blogger and blogs at the content marketing blog, conversionchamp. He loves to talk about content marketing, conversion optimization and lead generation. Add him to your Google Plus circle. One in every 10 adults likes to be their own boss. This is not my theory. This is the outcome of several national surveys conducted in the US and UK. 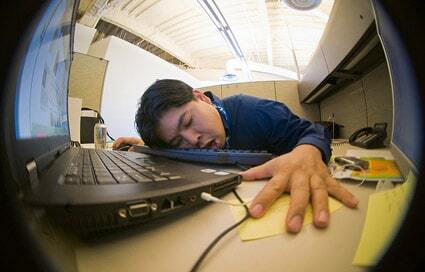 Many people ask me whether they should quit their day job to start an online business. Do I need to quit my job to start my blog and become a pro blogger? If so, how and when should I say good bye to my job? Do you think I can become a success if I work very hard? I’ll blog every-day, comment on 50 blogs each day and work very hard. I’ll answer this by breaking down the question. Blogging at night, Working at day. Don’t sound & seem right, isn’t it? Simply put, NO. You needn’t quit your regular 9-5 job to start a blog and realize your dream of becoming a pro blogger. In fact, when you start out, it is not recommended that you quit your job. There are several reasons why I tell you this. It puts pressure on you. You don’t have an income source. So you have to earn money from your blog somehow. Especially, if there are others who depend on your income. Blogging by itself is not a viable business model. Profiting from blogs takes time. Unless you have a cushion of money to support yourself for 24 months, don’t quit yet. Chance of failure is high. I admit that starting a blog is very easy. But, the chances of failure are very high too. If you don’t plan properly, then you are in for trouble. If failure is not something you can live with, don’t quit your day job yet. Not everyone is fit to be an entrepreneur. OK. Now you are afraid to quit your job. Wait. I haven’t told the best part yet. Although you may not need to quit your day job when you start out, you may probably have to in a few years. 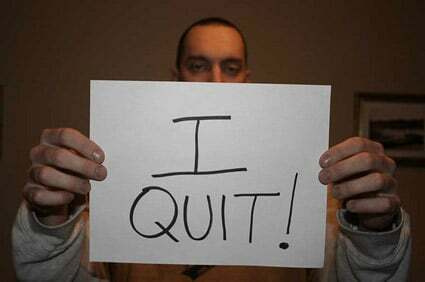 Should you say “I Quit” or “I Leave”? You have built a strong community with loyal readers. Your income via blogging is at least 75% of your full time income. You are able to diversify your income so that if one income stream fails, you are not left in the dark. You are absolutely committed to making things work (Mind you working from home can be highly unproductive and a waste of time if you can’t focus on revenue generating tasks). This will not only boost your confidence, but also take the pressure of “no-monthly-pay-check” from you. Most people live from pay-check to pay-check. If you are going to quit your job, that idea should be kicked out first. Can I find success with my pro blogging ? Yes, absolutely. In all ways you can be a success story. It’s a matter of planning well and executing the plan properly. No matter how hard you work, if you did not plan properly, you will fail. But do it correctly, and reward shall be yours. Hope you are inspired a little bit after reading this post & take the right decision on your blogging career. Adarsh is a full-time blogger and gives consultancy services as well. To know more about him follow his blog & social profiles. hmm… must read for newbies, who get easily confused ! You are right about getting confused. Lot of conflicting information online! Even with a corporate job, there is no guarantee of any success. Thanks for sharing your thoughts Tushar. Success rate in blogging is less, so we have to think thrice while taking decision to quit a 9 to 5 job or not. Making money from blogging is becoming more and more difficult. But it’s not impossible. Creating a niche for yourself can make the difference. I think when you think you can make more per hour blogging than you get paid at your current workplace it’s time to call it quits. But it’s important to think it through, and I suggest having a money stash of about a year (less if you’re more of a risk taker) before making the leap. You could start blogging on the side when you are at your job. Then maybe when the income becomes 75% of your corporate job, you could consider quitting. As you said, having money in the bank for a few months definitely helps. Glad that you enjoy your work. Very sound advice! I would also add that having some savings set aside as a cushion would be wise in addition to everything that you mentioned! That’s definitely a good idea Stacy. Hi Adarsh, I never wanted to quit my job but I got so bored with it! eventually I found myself having the most difficult time to produce any type of work. this was because I didn’t love what I did even thought I wanted to do well, my mind wouldn’t allow it. So now I have stopped and started working full time on blog engage. I’m very lucky to be making enough with Blog Engage to work full time! This is but a dream of mine right now. Your experience somewhat resonates with mine too. Only thing is I loved marketing more than my tech job. So I quit! Hey your very welcome my friend! It’s a please reading you content, sharing my experience is how I like to hopefully ad some value to your topic. Reading this makes me realize how important it is for me to persevere and put more effort to succeed. Very informative. Great to know I could help you arturo decena. Thanks for the insight! As a new blogger myself, this article helps me put things in perspective. Glad I could help Jonathan. It would be great to quit work and work on blogging full-time, but with me current situation – raising a family – I don’t see it happening soon. Everyone’s situation is different, and if someone is thinking about blogging full-time they would definitely need to have a plan in place in order to succeed. Not many people can afford the risk of going the pro blogging route. Every now and then I get an email from someone who wants to quit their job and become a full time blogger and I have to burst their bubble. I feel like I’m being a Negative Nancy, but I would hate to encourage someone to walk away from an income to approach something that that they don’t have a lot of experience in; but I do believe that becoming a successful full time blogger is possible. The biggest challenge I foresee for people is staying motivated and productive. Out of all the blog accounts that are started each day, I’m curious to know how many are still active a year later. The only reason I’m still here is because (1) I love it and (2) I love learning new things. Otherwise, I would have given up a long time ago. +1 for “staying motivated and productive”. This can be a real issue even for experienced bloggers. I usually waste a lot of time watching movies (they are my biggest passion after marketing). i was thinking to quit my job when I started my blog but after few days I had realized that it is not easy to make money online as easy it looks. Thanks for sharing. True. making money online is never as easy as it looks! I wouldn’t quit your day job, but start one on the side as a hobby and nurture it. You never know if something bad may happen and you find yourself going from FTE to “Blogger only” due to downsizing. It helps cushion the blow and gives you something to invest in. True. A lot of people do side gigs when they work full time. Your strategy is a sound one for low risk takers and people who easily lose motivation. It’s also more logical than simply jumping into something you have no idea about. Very useful post, and I must say from my personal experience that you don’t need to quit your job if your blog income is 75% of your full time income. Wait for it to be fully functional website and that you surpass your full time income from job. Thanks for chiming in James. When I said 75%, what I meant is the minimum so that you don’t have to overly worry about not getting paid. Everybody need to lots of research before start blogging. While that is a personal question to whomever asks it. I think if you have drive and something to say you can make it and be a blogger, but I think people really need to do some reasearch before they quit their jobs for blogging. True. A lot of research is needed before going the pro blogging route. Thanks for sharing your thoughts Shane. Well, blogging is a very serious passion especially if you would want to earn big from it. However, I don’t think quitting your day job immediately is a good option. If one would like to earn from blogging or from the Internet, they need to assess their skills, their talents and how much motivation they have. Not everyone is meant to be an online entrepreneur. Try it while still maintaining your day job, if blogging lets you earn more than your day job each day, then that is the time to quit your job and pursue blogging full time. For some people earning from blogging is not a yard stick. But for most people it is. I say, follow your passion! Thank you Jasmine. Wishing = procrastination = no success. If you want to do something, just take the risk. Take calculated risk… need to think first, but just don’t take too long and don’t procrastinate too much, haha! Great article. But What should a student do in the similar case..?? The situation becomes quite different then when you have to choose b/w a job as a fresher or blogging. It all depends on what your end goal is. Do you want to be an employee or a self employed guy? Do you enjoy writing for years to come? Are you comfortable working alone from home instead of in a team? A lot of it boils down to your personal preference. Ya, You are correct. Its our personal choice What to chose ? But it requires a lot of courage too. Since presently we are blogging part time, but taking it as a profession and depending fully on it may require a confidence, courage and of course risk taking capability. BTW your replies has boosted my confidence. I am glad I could be of help. Keep blogging and all the best.